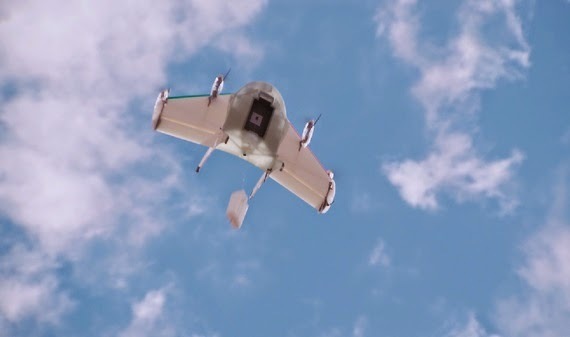 Last spring, Amazon said - supporting video - work on future deliveries via drones. Most comments were derisive if not bitter about this delusional vision of the future. In unveiling Project Wing, Google shows it also participates in the "delirium". It is now two years since Wing Project was initiated within Google X, the famous laboratories out of which the most original creations like Google Glass or Google Cars. The history of these drones deliverymen is told in great detail by Alexis Madrigal (what a pretty name for a new storyteller) of The Atlantic. Google has other projects in robotics meets our colleague, adding: "Google not only wants to organize the world's information, Google wants to organize the world." Wing Project is original in design to the extent that it remains in the air for deliveries and deposits its package through a wire to which is attached the object. For now, Google would have led thirty tests on Australian territory and, after careful investigation conducted by our colleague Madrigal, last night would have recognized the existence of this project. This one would be led by Nick Roy, an expert on robots working for MIT and that would have taken two sabbaticals to work on the project at Google. Nick Roy will now step down and be replaced by Dave Vos, another specialist drones with over 20 years experience. According to members of the Google X in charge of the project, it would be viable if there is a lot of obstacles, all surmountable by them. "It sounds crazy, it's crazy but maybe Google is very serious about the delivery of objects through the air." Now, the search giant will mingle with others involved in the drones to regulatory changes.